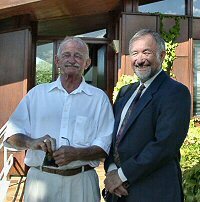 György Jaros was born at Budapest on 22 February 1940 and moved to South Africa in 1958, where many people call him Gyuri or George. He studied Electrical Engineering at the University of Witwatersrand and obtained a PhD in Physiology at the University of Pretoria. He has two daughters, Stephanie and Erica, and a son, Gustav, from his first marriage, and is married to Lilyan Nuss.